The charming small church at East Worldham (Hampshire) has but a single medieval monument. 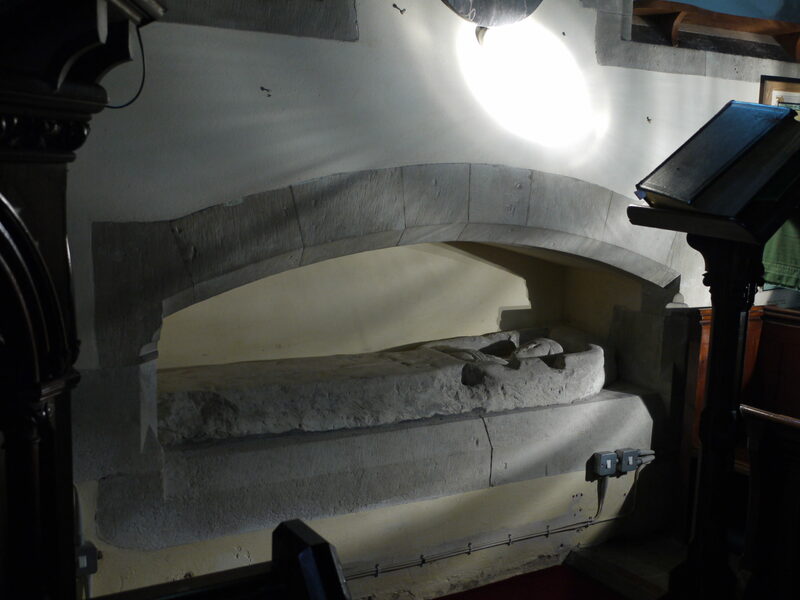 This is a semi-effigial slab, positioned in a recess in the south wall of the nave with a low arch above. This may well be its original position. The upper part of the slab has an aperture with a carving in sunk relief of the head and hands of a female figure with her hands folded loosely on her breast. 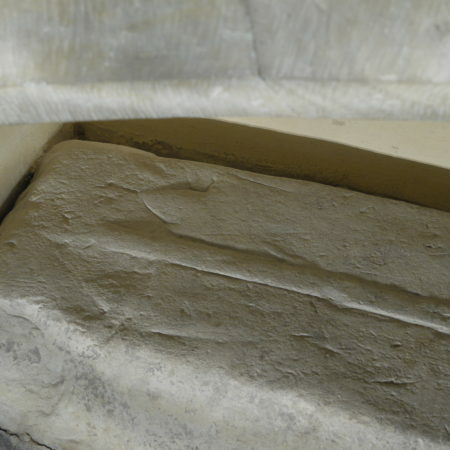 The rest of the slab is carved at a higher level, the main feature being a cross carved in relief; the head is a straight-arm cross with trefoil terminals but the bottom is too worn for its form to be discerned. It was probably made locally, as one odd feature suggests. 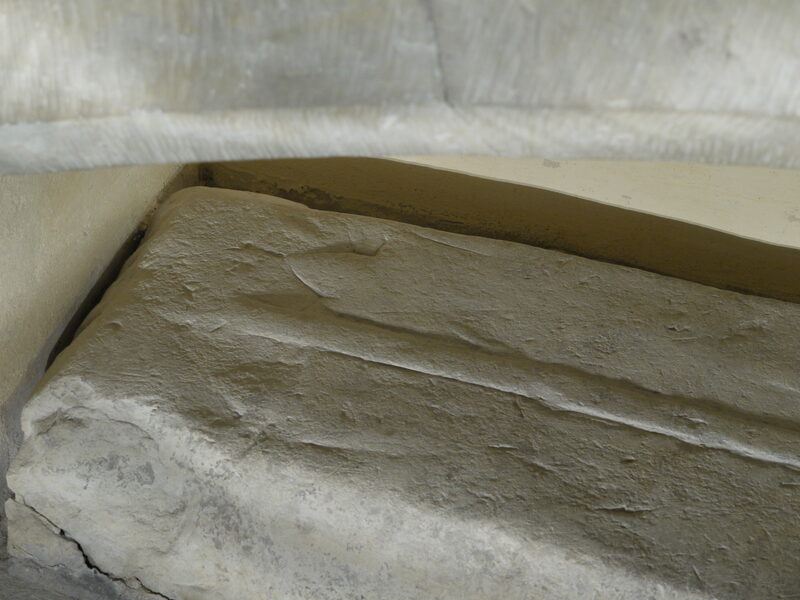 Although the overall appearance is of a coffin with an aperture cut in it to reveal the body below, on either side of the base of the cross carved on the higher surface of the slab are shown the very worn feet of the lady with the foot drapery of her tunic. The body is thus shown on two different levels; the carver seems to have been confused as to what exactly this type of monument was meant to represent. 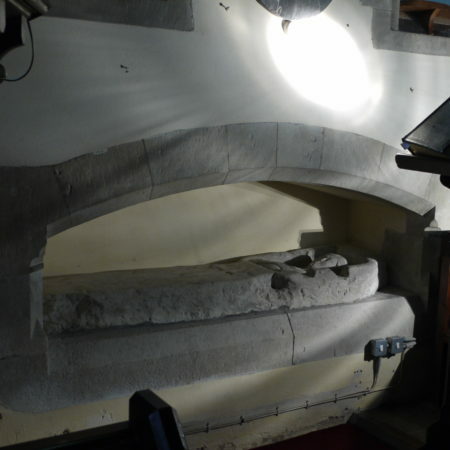 There has been a long-held local tradition that this is the monument of Philippa Roet, the wife of the famous poet Geoffrey Chaucer and sister to Katherine Roet who was mistress to John of Gaunt and subsequently his third duchess. Philippa was born c. 1346 and died c. 1387. There is a link between East Worldham manor and a member of the Chaucer family: Thomas Chaucer (1367-1343), Philippa and Geoffrey’s son, married Matilda, daughter and coheiress of Sir John Burghersh, nephew of Henry Burghersh, Bishop of Lincoln. For several centuries, the manor of East Worldham had been held by the de Venuz (or Venuiz) family, but the Patent Rolls record that, as the result of a trial in 1329, the manor passed, on the death of Margery, widow of John Venuz, to the Burghersh family. Thomas Chaucer inherited this manor with many other lands as a result of his marriage to Matilda Burghersh, but his mother Philippa Roet was never associated with the manor and so is unlikely to have been commemorated in the church. 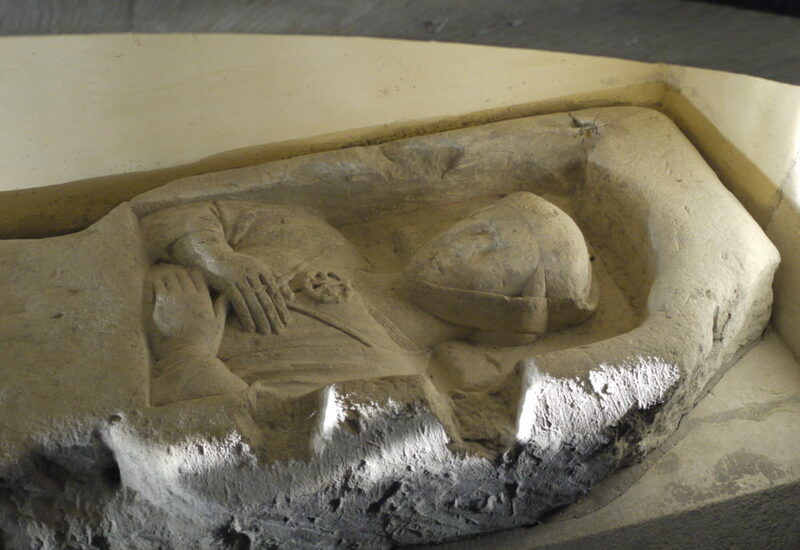 There are various other reasons why the monument at East Worldham cannot have commemorated Philippa Chaucer. First, this type of semi-effigial monument was in fashion in the late thirteenth and early fourteenth centuries; some examples were made later but none are known as late as the later 1380s when Philippa died. Second, the costume shown is appropriate to a date in the late-thirteenth century. She wears a super-tunic with a cloak over it held in place by a cord. The neck of the super-tunic has a slit and beneath it is another garment, either made or fur or with fur trimming at the neck. The woman’s hair is all but covered by a veil; this and a linen band round the chin are held in place with another deep linen band. The belief that the monument commemorated Philippa Roet appears to have stemmed from the circular device on her upper chest. It has been interpreted as a wheel from the Roet arms, but close examination shows it is actually a buckle comprising two semi-circles which joined together to fasten the two flaps of her supertunic.